Following the very successful launch of the new Church at El Peral on 11th January, the Church of England continues its planned expansion in the Almanzora Valley with an all-new pattern of regular Sunday Evening Services at the already popular Church at Aljambra, Albox, starting with a Service of Holy Communion at 6:00 pm on Sunday 1st February. This will be followed by 6:00 pm Services every Sunday, alternating between Communion and Evening Worship, whilst the ever-popular Communion and Lunch held at 11:00 am on the last Thursday of each month, will continue unchanged. Over the 8 years in which Services have been held twice per month at Aljambra, many people have found the occasional nature of these a touch confusing, and there have, as a result been a number of requests for a more regular pattern, so this is the outcome. In addition, despite frequent comment in such as Sol Times, there are still many people unaware that the Church of England actually exists here in Spain, so it has been felt that a more regular pattern of Services would enable the Church to become available to more of the large British population within the Almanzora Valley. For many, of course, their first experience of the Services offered, is sadly, at a funeral, for over the years, C of E Priests and Lay workers have officiated at a huge number of funerals in this area, offering comfort and support to hundreds of bereaved, whilst also Blessing many Marriages and welcoming children into the Church at Baptism. In addition of course Remembrance, Armistice and Carol Services form an essential part of the normal life of so many British residents here in Spain, yet for many, retiring here results in a winding down, loosing the ‘habit’ of Church attendance and the consequent loss of spiritual and social growth. But of course English language Churches are a bit thin on the ground over here, and for those of us living in or around Albox, the 90 mile round trip to attend Church in Mojacar, our nearest regular Anglican Service until now, was quite a facing. And so it is that these two Churches within the Almanzora Valley are now being developed, in hope that many may, as a result be encouraged to once again start coming to Church on a regular basis. So when and where are these Services? Well the Church at Llanos del Peral is about a mile up the road from La Vida Restaurant at Cucador, and as mentioned earlier, a Service of Holy Communion is held there every Sunday Morning at 11:00. Aljambra Chapel is in the Centre of Aljambra in Albox and it is planned to hold Services of Holy Communion there at 6:00 pm on Sunday 1st February and also on 15th, with a Service of Evening Prayer/Worship on the 8th and 22nd February, plus of course Communion, followed by Lunch on Thursday 26th February at 11:00 am. 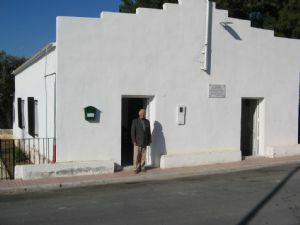 The Church in Mojacar is at Enmedia, opposite the New Golf Course on the road to Carboneras, just past the new Macenas Development and has Holy Communion every Sunday at 11:00 am. 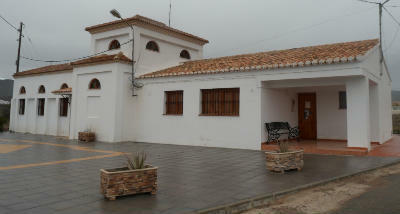 The Church also holds Services on the third Thursday of each Month at Burties bar in Roquetas.